Anchorage, Alaska - The FBI in Alaska has released a statement on the conviction and sentence of former Alaska state Representative Victor H. Kohring. From an FBI press release: WASHINGTON - A federal jury in Anchorage, Alaska, has found former Alaska State Representative Victor H. Kohring guilty of conspiracy, bribery and attempted extortion, Assistant Attorney General Alice S. Fisher of the Criminal Division announced today. Following an eight-day jury trial, Kohring, a member of the Alaska State House of Representatives from 1994 to 2007, was convicted of conspiracy, bribery and attempted extortion, for corruptly soliciting and receiving financial benefits from a company in exchange for performing official acts in the Alaska State Legislature on the company's behalf. On May 4, 2007, Kohring was arrested following the unsealing of two indictments charging him and two former Alaska representatives with various public corruption offenses. At trial, the jury heard evidence that Kohring, while serving as a member in the state legislature, solicited bribes from and took action to benefit the financial interests of VECO Corporation, a major Alaska oil services company. Trial evidence, including more than 25 recordings of conversations involving Kohring and former VECO executives, showed that Kohring repeatedly agreed to lobby his colleagues and, if needed, cast votes in VECO's favor on a key petroleum production tax proposal pending before the Alaska legislature. In exchange, Kohring received multiple cash payments and solicited a $17,000 payment. "Former Representative Victor Kohring betrayed his oath of office and the people of Alaska when he deliberately and repeatedly took bribes in exchange for official acts," said Assistant Attorney General Fisher. "I thank the federal prosecutors and FBI agents who have worked so hard on this case. Their efforts demonstrate that the Department of Justice will pursue public officials who abuse their positions of power for their own financial gain." The VECO executives who testified at trial, former Chief Executive Officer Bill J. Allen and former Vice President of Community Affairs and Government Relations Richard L. Smith, pleaded guilty in May 2007 to providing more than $400,000 in corrupt payments to public officials from the state of Alaska. Kohring is the third former member of the Alaska House of Representatives to be convicted this year of corruption crimes. Thomas T. Anderson, a former elected member of the Alaska state House of Representatives, was sentenced to 5 years in prison for extortion, conspiracy, bribery and money laundering for soliciting and receiving money from an FBI confidential source in exchange for agreeing to perform official acts to further a business interest represented by the source. Peter Kott, a former Speaker of the House of Representatives, was convicted in September 2007 of extortion, bribery and conspiracy, and is scheduled to be sentenced on Dec. 7, 2007. Kohring faces a maximum sentence of 20 years in prison on the attempted extortion charge, a maximum sentence of 10 years on the bribery charge, and a maximum sentence of five years on the conspiracy charge. U.S. District Judge John W. Sedwick of the District of Alaska set sentencing for Feb. 6, 2008. This case was prosecuted by trial attorneys Nicholas A. Marsh and Edward P. Sullivan of the Criminal Division's Public Integrity Section, headed by Chief William M. Welch, II, and Assistant U.S. 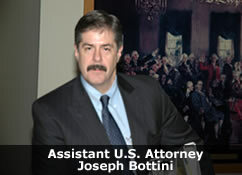 Attorneys Joseph W. Bottini and James A. Goeke of the District of Alaska. The case is being investigated by the FBI and the Internal Revenue Service Criminal Investigative Division.